Great Wall Motor has become the first Chinese carmaker to open an assembly plant in Europe as it aims to lift sales in the region. 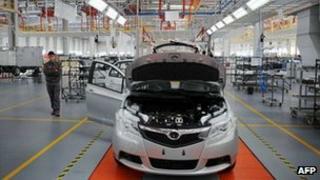 The factory, in the northern village of Bahovitsa in Bulgaria, will eventually produce 50,000 vehicles a year. The facility was built together with Great Wall's Bulgarian partner Litex Motors. It will manufacture Great Wall's Hover SUV, Steed pick-up and Voleex city car models. The plant will initially employ 150 workers capable of making 4,000 vehicles per year, rising to 2,000 employees when at full capacity in 2013. "Great Wall's plans to build a plant in Bulgaria and produce automobiles here are aimed at boosting our production capacity and exporting these automobiles for the European market," company president and chief executive Feng Ying Wang said. "We estimate that in three to five years we will have a wide range of models made here and that these cars will be sold in all European countries."